Orillia children in need will receive a special toy over the holidays courtesy of parking tickets. 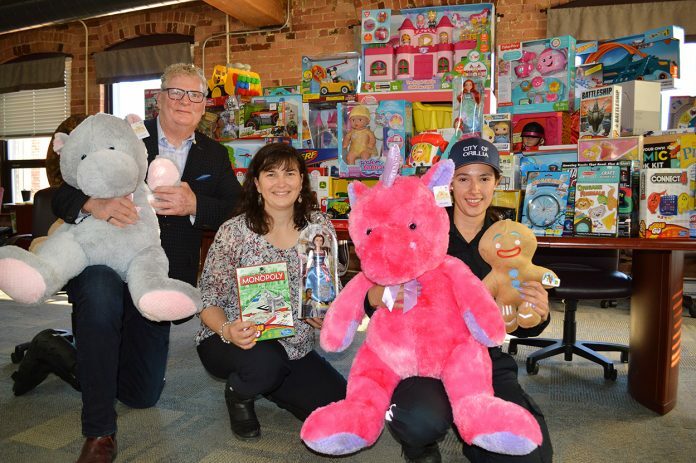 The 2018 City of Orillia Toys for Tickets campaign raised more than $1,100 in children’s toys, which are being donated to the local chapter of the Society of St. Vincent de Paul. Toys for Tickets invited every person who received a parking ticket (with the exception of accessible parking violations) in the City of Orillia between Nov. 1 and Dec. 1, 2018, to pay the fine amount by donating a new children’s toy of equal or greater value. “The Christmas season can represent a financially difficult time for some our local families. The Toys for Tickets campaign offered by the City of Orillia is a tremendous help to families as it eases the financial burden of gift-giving. We are grateful to the City of Orillia for this generous campaign. Thank you for helping us help others,” said Tara Treash, President of the Society of St. Vincent de Paul in Orillia. Over the past 13 years, the City of Orillia Toys for Tickets campaign has generated approximately $35,000 worth of new toys in lieu of payment for parking tickets.